In a beautiful and yet deeply meaningless coincidence, Buzzfeed News is reporting that Louise Linton, the Scottish actress who wrote a moderately racist and very silly memoir about living in Zambia, is dating Donald Trump’s finance chairman. The human heart is a mysterious place, much like “darkest Africa,” as our friend Louise’s publisher might put it! In a telephone interview Monday, Mr. Mnuchin emphasized the friendship part of the equation. “I was there at the beginning when he decided to run for president, and I’ve been a supporter and quiet adviser behind the scenes to him,” he explained. The day after Mr. Trump won the New York primary, Mr. Trump called Mr. Mnuchin and offered him the job. “I told him on the spot I would,” he said. Linton has met dozens of big names in the US, and has even dined with Donald Trump. Describing the experience, she said: “I sat next to him at dinner and he was charming and engaging. Donald Trump is an OK seatmate: noted! 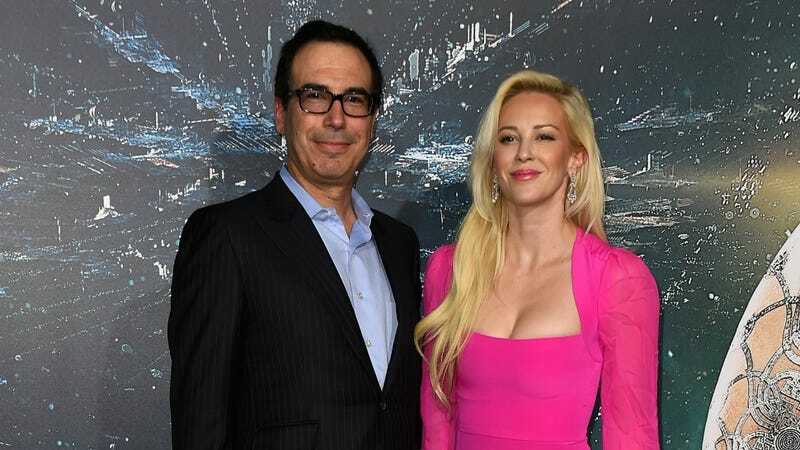 Heat Street reported that Linton has been Mnuchin’s companion since he broke up with Heather Crosby, a Goldman Sachs director he married in 1999. Linton, then going by Hay, married a lawyer named Ronald Richards in 2005. The couple were still married around 2011, but now, clearly, they are not. What do we do with this information? Can we draw any inference here? About love? About Donald Trump? About Louise Linton and what one British tabloid termed her “heart of daftness” memoir? We cannot! None of this means a thing, and yet it is somehow, nonetheless, very funny.